Through our subsidiary company, Brobulk Ltd., GAC offers trading companies and other charterers the ability to outsource bulk and break-bulk ocean freight requirements. Brobulk Ltd is a well-established ship operator running chartered tonnage from 10, 000-70, 000 DWT with significant maritime expertise and financial stability. APSEZ ports are strategically located across the entire length of the Indian coastline and are ideal for global trade due to multiple benefits like deep draft, abundant storage, multimodal connectivity etc. Most of our port locations are situated enroute international shipping destinations with facilities for 24x7 safe berthing, unberthing and vessel operations. Wide variety of build to last Dry Containers are manufactured for different applications. Our path-breaking concept of ‘Achievements’ has revolutionized the transportation industry. 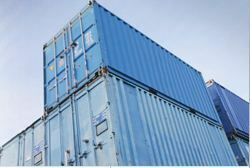 It is specially designed iron cargo storage containers, available in varying sizes, in which your goods fit snugly so that they are not jostled around and can be transported safely without incident. Excellent Packers and Movers, offer our clients cost-effective Dry cargo containers .Dry Cargo Containers and Shipping Containers are an effective way to store and transport your furniture and goods at your leisure. Our superior quality Dry cargo containers ensure safety and security of personalized goods. Aerospace One has been an active operator in the air-cargo market, using leased aircrafts as well as its own to transport dry cargo, emergency assistance, and livestock on either ACMI or full-chartered basis from the Central Asia and Indo-china regions to the Middle-East and the Gulf. IMC provides O&M terminalling services in the dry bulk sector. At New Mangalore Port, IMC provides O&M services to Udupi Power Corporation, for handling coal imports at the port and load the coal into rail wagons for onward movement to the Power Plant. In a short span, IMC has demonstrated its capability to handle Panamax ships and loading of rail wagons.